It’s time to liven things up for the holidays. What do you say? I’m kind of pumpkin-ed out anyway, if that’s even possible. That means one thing: It’s time to rely on my go-to Christmas flavor combination – chocolate peppermint. The concept for this recipe was adapted from my Gluten-Free Birthday Cake! 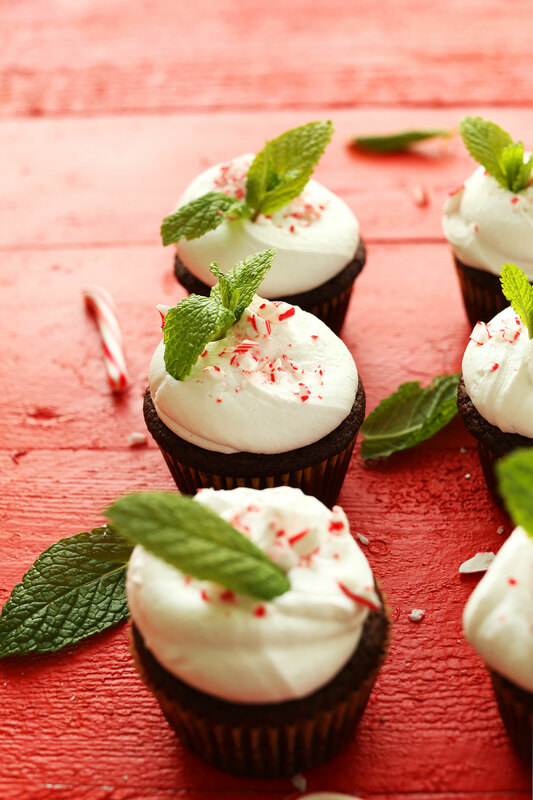 Tender, vegan, and gluten-free chocolate cupcakes infused with peppermint oil and topped with peppermint coconut whipped cream and all kinds of minty things. Sounds complicated, huh? It’s not! This recipe requires just 1 bowl, simple methods, and about 1 hour to prepare. 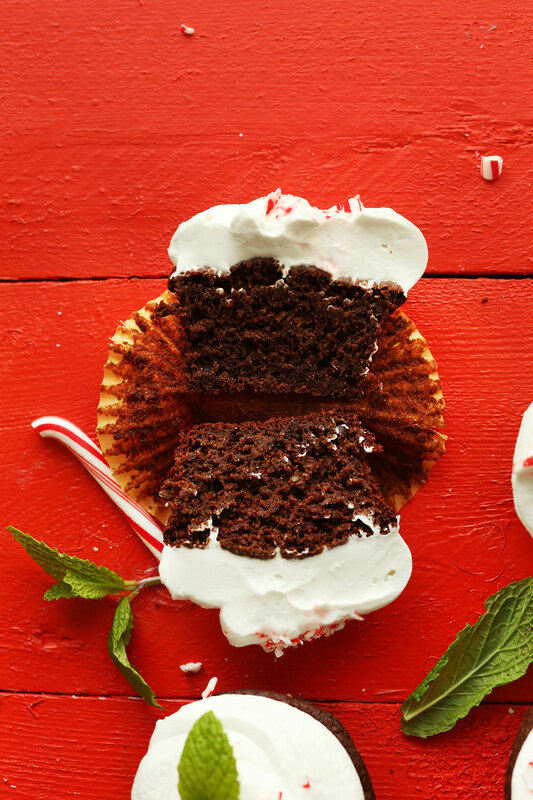 The coconut whipped cream is the perfect light and fluffy topping for these rich, chocolaty cupcakes. 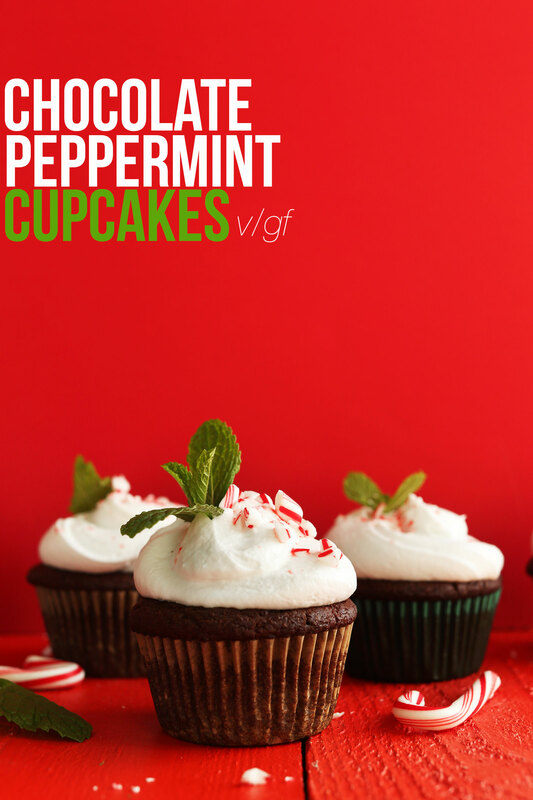 The peppermint oil adds an extra cooling effect, and the crushed peppermint adds just a little crunch. Major swoon. 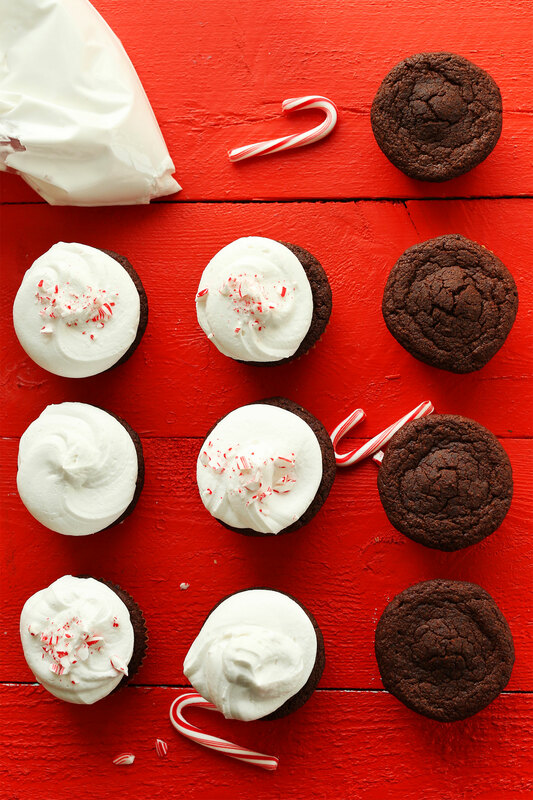 These cupcakes are perfect for serving at holiday gatherings, or even to make as little homemade gifts! Who would turn away a cupcake that looks this pretty? Throw in some of my Quinoa Granola and your friends will be utterly spoiled. If you try this recipe, let us know! Leave a comment, rate it (once you’ve tried it), and don’t forget to tag a picture #minimalistbaker on Instagram! We’d love to see what you come up with. Cheers, friends! 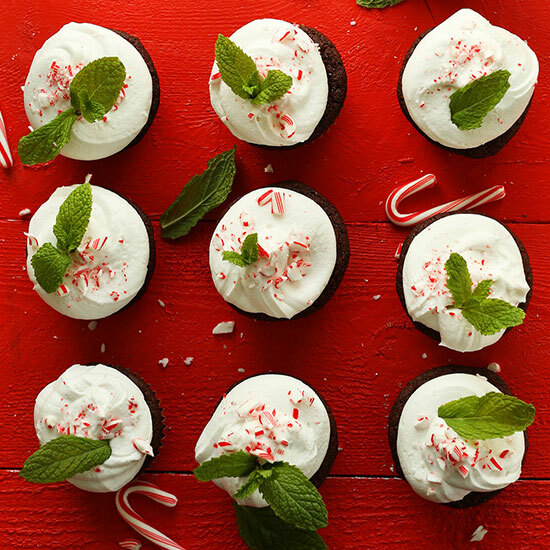 Naturally-sweetened, 1-Bowl Chocolate Peppermint Cupcakes that are vegan and gluten-free and topped with mint-infused coconut whipped cream! 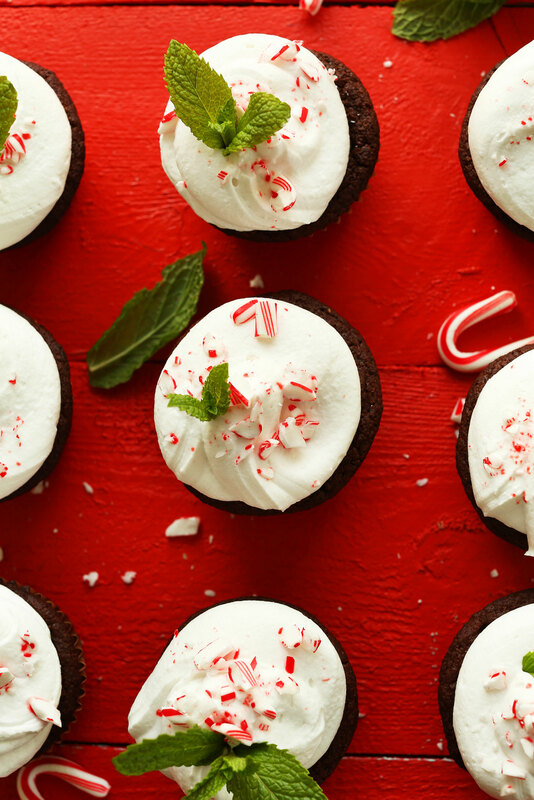 The perfect dessert for the holidays and chocolate-peppermint lovers! FOR CUPCAKES: Preheat oven to 375 degrees F and line a muffin tin with 11 paper liners (I like this brand // amount as original recipe is written // adjust if altering batch size), or lightly grease. Measure out almond milk and add vinegar or lemon juice. Stir and let curdle while moving onto the next step. Add baking soda to the almond milk vinegar mixture and stir. Add the sugar, maple syrup and almond milk mixture to the flax egg and beat to combine. Then add melted coconut oil, applesauce, salt, and peppermint extract, and mix. Add cocoa powder, almond meal, oat flour, and gluten-free flour blend and beat to combine. If the batter appears too thick, add a touch more almond milk, but it should be perfect. If too thin, add a little more gluten free flour blend + cocoa powder. Taste and adjust amount of peppermint extract as needed. Divide batter evenly between lined muffin tins (should be enough for 11 as original recipe is written // adjust if altering batch size), filling generously 3/4 full. Let rest in the tin for 10-15 minutes, then remove and let cool completely on a cooling rack. Don’t try to sample early because they need to fully cool or they tend to stick to the wrappers. 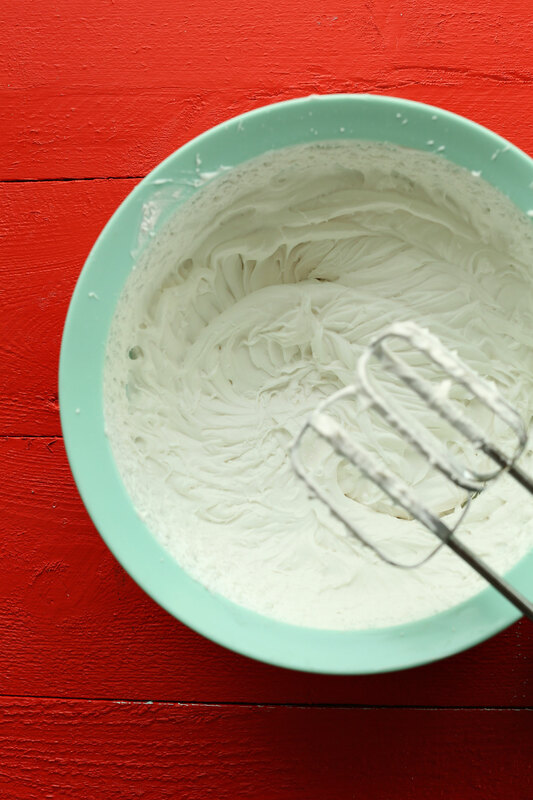 FOR COCONUT WHIP: Rinse out mixing bowl and add two cans hardened, chilled coconut cream. Beat until light and fluffy, then add peppermint extract and organic powdered sugar to taste. Taste and adjust flavors as needed. Then scoop into a large freezer bag and set in refrigerator to chill. Once cupcakes are completely cooled and you're ready to serve, cut a corner of the coconut whipped cream bag off and pipe a generous amount onto each cupcake. You’ll likely have leftovers. Lastly, add desired toppings, such as crushed peppermint candy and fresh mint leaves. Will keep well-covered in the refrigerator for 2-3 days, though best when fresh. If possible, don't frost until serving for best results! *Nutrition information is a rough estimate calculated with a generous amount of coconut whipped cream frosting. Hi! Would I be able to use almond flour instead of almond meal or would that change the consistency? Yes you can, Patricia! Sub at a 1:1 ratio. Can I use cocao instead of cocoa powder? This recipe looks amazing! I was wondering, could you sub cacao powder for the cocoa powder? Thank you! I made these for a vegan friend’s Christmas Eve party- they were wonderful and SO delicious! Of course, all the non-vegans loved them too! My slight modifications: I used the roasted beet-puree option, and since I didn’t have any oat flour, I just used more G-F flour. I did end up needing to bake them for about 15 minutes longer than stated (I just tested them with a toothpick after every additional 5 minutes until they were done to my liking), but they came out beautifully domed and so soft and moist inside. And, instead of the whipped topping, I made a vanilla-peppermint “butter”cream (made with Earth Balance baking sticks and Spectrum organic shortening) to top them so they could withstand sitting out at the party for a while. Really really sad, we can´t eat them. I made these and came out great, just wondering what do you use for putting the frosting on cupcakes? Piping bag? I put mine with a butter knife and it doesn’t look great. Thanks! Yes, use a piping bag if you have one! Otherwise, you can make a DIY piping bag: take a plastic sandwich bag, fill it with icing and then cut a small hold out of one of the corners and squeeze your icing through it! Hope this helps! If I wanted to make this as a cake instead of cupcakes, is everything the same but just split it between 9″ round tins? Do we substitute the same amount of reguakr flour as the gluten free flour? Yes! Let me know how it goes, Shayna! Oh, these were so fun! Great Christmas holiday baking with my kids. The cupcakes are nice and story and not too sweet, and we loved the addition of fresh mint on the whipped coconut cream. I made this for dessert tonight as we had a few friends coming over for dinner. They were great, not too sweet and really complimented by the coconut flavor in the whipped cream. They stuck to the liners though so next time i would just grease those. Also used stevia baking blend instead of coconut sugar and two fresh eggs. Will make again, thanks for the festive recipe! Is it ok to substitute eggs for flax eggs? It should, yes! One small chicken egg per flax egg. I am going to make these as the gf/vegan dessert for my friend’s wedding. I was going to sub almond extract instead of peppermint. I also need to make them 2 days ahead. Any suggestions on how to store them? Do you think you could use extra virgin olive oil as I am allergic to coconut oil? These look lovely, would they work with any other oil as I am allergic to coconut oil? Many thanks and happy New Year? If I wanted to make this into a layer cake, how should I adjust? I made them as cupcakes and they were lovely! I’d like to do this as a centerpiece dessert for a party with your frosting as the filling and a white chocolate buttercream as the final icing. See this recipe as a guide! I love your blog! I have tried lots of recipes and they all turned out wonderful and I appreciate them so much..except this one oops. It is completely my own bad but I am trying to figure out what went wrong. It turned out very mushy, almost like a budding. I think I underbaked them, although it was in the oven for 35 min and the toothpick came out clean. Any ideas? Also when I added the baking soda in my almond milk/apple cider vinegar, it started a big reaction with lots of foam and bubble, is that normal? I just kind of let it set and waited for the bubbles to go away. Anyways, please keep the recipes coming and thank you for all your good work. I am going to try to make this one again. : ) Happy New Year! Made these for Christmas and my whole family loved them! ? Used brown sugar instead of coconut sugar, tasted fine. I would like to make another batch and freeze them (already frosted). Will they survive a freeze and defrost?! I haven’t tried freezing them, but yes, if you freeze them they should keep. However, it would’ve been best to keep them unfrosted. Let me know if you have success! Assuming I can swap out the flax eggs for real eggs if I don’t need them to be vegan? I modified the recipe slightly, using rice and quinoa milk instead of almond, as well as some slightly different gluten-free flours, but they still came out superb! I made these this morning right before going to work, and they’re nearly all gone. That’s a sign, hehe. Can I substitute pumpkin purée for applesauce? I think that should work, but I haven’t tried it myself! Let me know if you give it a try! It looks delicious! I like your photos! Especially with peppermint. Is there a substitute for the oat flour? Its impossible to find it Gluten free in Australia and I react to the only brand that states they are :( would quinoa flour work? I think quinoa flour would work, but I’ve never used it. When in doubt, sub a mixture of more GF flour and almond meal! Also, you can make your own oat flour by grinding GF oats into a meal. See this post for tips! Did you add xantham gum to your gf flour? If so, how much? I love these! 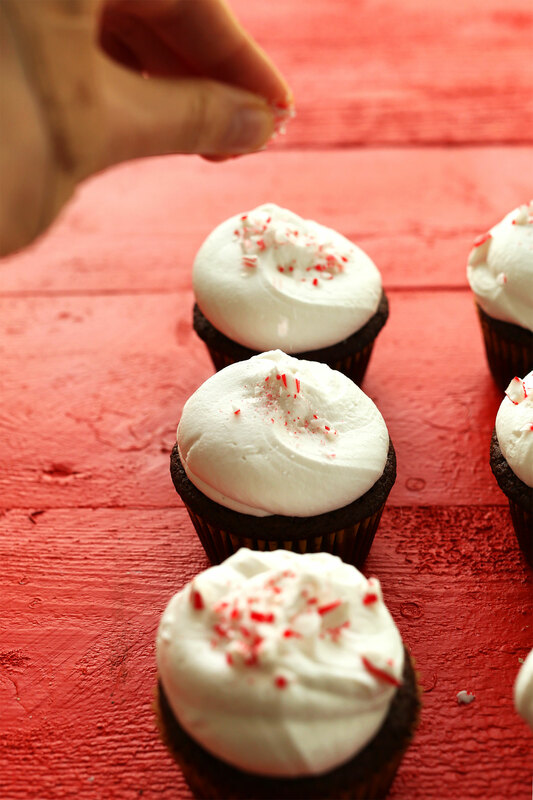 Pretty sure that peppermint/coconut frosting is calling my name. xoxo. You would LOVE it, friend! Hope you give them a try! Do you have any substitution ideas for the almond meal? I’m needing a nut free recipe. I would suggest adding more oat flour + gf blend! Great Christmas recipe–I love how festive it looks :) yum! What could be substituted for the almond milk and almond meal? My daughter can’t have almonds. I’d sub more oat flour + gf blend, and use coconut or rice milk instead! Can I use regular sugar instead of coconut sugar? Thank you! Looks so incredible! Is it possible to make it nut-free? I would love to try it but I am allergic to almonds. I would sub coconut milk or rice milk for the almond milk, and sub a blend of more oat flour + GF blend for the almond meal. Good luck, Jenna! I made these today! They taste great but they sank after taking them out of the oven! And went a little heavy ): I’ll keep practising them but I’m not sure what happened! Did yours sink at all? I did use normal flour as I’m not GF but this shouldn’t make a difference! Hmm, I haven’t tried these with normal flour. That shouldn’t have been an issue, but it might’ve been the cause! Mine did fall a little bit, but only a tad! I have found that roasted beet puree (if you have the time), does work better than applesauce in making them moist and fluffy. Give that a try if you make them again! Aww yeah I love chocolate + peppermint! So festive! I would substitute any milk (dairy or rice), and a mix of oat flour + GF blend! These cupcakes look amazing, the chocolate cake looks so light and the coconut whipped cream is delicious, can’t wait to make them! Omg I wish I had thsee for breakfast! I LOVE peppermint and chocolate combo! They look too pretty to eat!! Ooooh Dana these look so cute! Could regular all purpose flour work in place of oat and gluten free flour? Yes! Let me know if you give it a try! Festive and bright. Oh sigh! So true. With 2 kids with strep throat and so much to do….wasn’t feeling festive. I love your pictures here. Peppermint always seem to settle your stomach too after too much festive eating. They kind of made me happy today. And I need good news after hearing that the Wen hair products make you bald!!! !